Which car&apos;s got the best taillights ever? Why They're Cool: The corporate Aston taillights are already pretty cool, whether they're on the back of a Rapide or Virage. But the One-77 takes those taillights and makes them something special. Stretching across the length of the car's rear end, these taillights cap off what is already a dramatic design with a little more flair. Why They're Cool: A car powered by something as exotic as a gas turbine needed some special-looking taillights. The entire setup of the Chrysler's rear end looks like the exhaust of a fighter jet, and the sneakily-hidden light clusters probably looked like glowing afterburners. Why They're Cool: The black strakes over the Testarossa's lights not only continued the cheese-grater styling theme of the sides of the car, but made the rear end look just about 50 feet wide. The tight packaging of the red main and brake lights, amber turn signals and clear reverse lights meant that the whole rear of the car could stay low, which only helped the car look even more massive than it was. Why They're Cool: The whole back end of the Reventon screams stealth fighter. Between the exhaust pipe, big cooling fans poking out from behind massive grates, and the awesome taillights, sitting behind a Reventon is not a bad place to be. The lights resemble the Lamborghini look from a couple of years ago, but their sideways-Y shape looks like nothing else on the road. Why They're Cool: The entire '69 Eldo looks shark-like, and while its fins are smaller than they used to be, they still poke up over the rear decklid. The wraparound lights in them are simple, but stylish. Why They're Cool: There are all sorts of things going on on the rear hatch of this Edsel. It's nowhere near as polarizing as the snout of the car, but the boomerang-shaped lights are still pretty awesome, if not a little confusing. The right-side light points left, while the left-side light points right. It's just another layer of weirdness on an old Edsel. Why They're Cool: The DeLorean reeks so much 80's cool that Nike had to get in on it. The gridded rear lenses of the DMC-12 are one of the best parts of the car, and might also be (apart from the doors, of course) the most recognizable. On an already cool car, the taillights take the cake. Why They're Cool: At first glance, the taillights of a DS don't look like much more than small, 1960's era lights that are probably on a handful of different models. But when you look closer at the car, you'll notice that the rear turn signals are actually on the back of the roof of the car, which is awesome. Putting them up there meant that they were right in the field of vision of drivers following the Citroen, and that they would look really cool. It's just another reason to lust after a Citroen DS. Why They're Cool: Much like the DS, there are just about a million reasons to lust after the Furai. One of them is its fantastic approach to rear lights. Looking like wisps of smoke, (but not bad engine smoke) the taillights on the concept Mazda seem to float in midair. They look too thin to be real, and yet there they are. And then, to top it all off the car's name, in Japanese characters, is illuminated right in the middle. 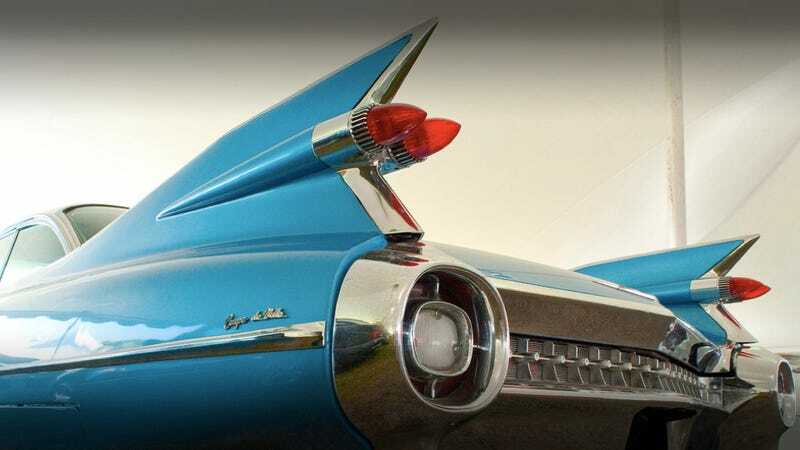 Why They're Cool: But really, when you're talking about taillights, you can get no cooler than the '59 Caddy De Ville. Massive tailfins end in double red lenses, with giant turn signals down below. The car looks like it has six jet engines poking out the back, which at nearly 19-feet long, the car would probably benefit from. The 1959 De Ville set the standard pretty high for cool taillights, which is why it earned the number one spot on today's list.